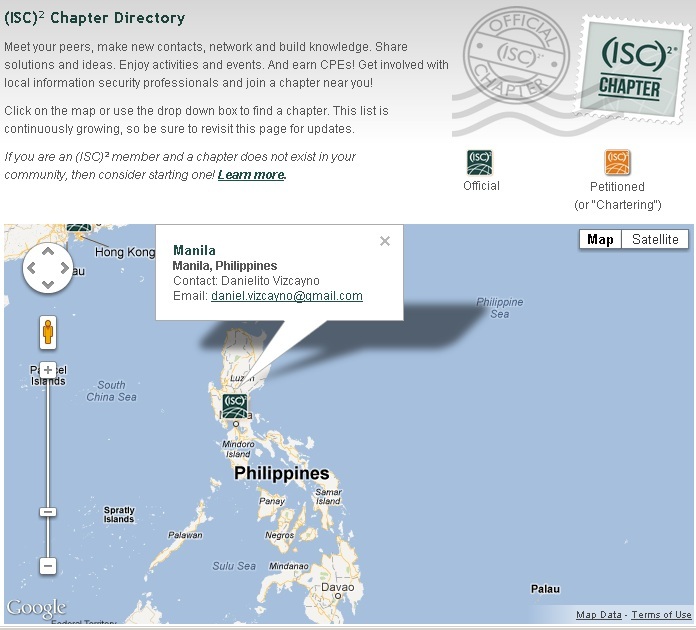 The Philippines finally has an official (ISC)² Chapter. Thanks mostly to the determination of Mr. Dan Vizcayno and its first Chapter Officers. Who can be part of the (ISC)² Philippines Chapter you may ask? Basically anyone interested in the Information Security field who has been actively involved in any aspect of Information Security work for at least one year. Active Member – (ISC)² International members interested in the purpose and aspirations of the Chapter. An Active member in good standing shall be entitled to vote and be an officer in both the affairs of (ISC)² International and (ISC)² Philippines Chapter. Associate Member – Non-(ISC)² International members (i.e., non-(ISC)² certification holders) interested in the purpose and aspirations of the Chapter. An Associate member in good standing shall be entitled to vote on any Chapter affairs and be an officer of the Chapter, except for the positions of President, Secretary, Treasurer and Membership. Holding these particular positions require (ISC)² International member status or an (ISC)² certification (like CISSP). Organization Member – Corporations that are interested in the purpose and aspirations of the Chapter. An Organization member in good standing shall be entitled to vote through its representative on any Chapter affairs and be an officer of the Chapter except for the positions of President, Secretary, Treasurer and Membership as they would require (ISC)² International member status. Student Member – Full time student currently enrolled in a degree program of an accredited college or university. Proof of enrollment shall be submitted annually. Student members in good standing shall not be entitled to vote and be an officer at the Chapter level.